Click images to see larger views. 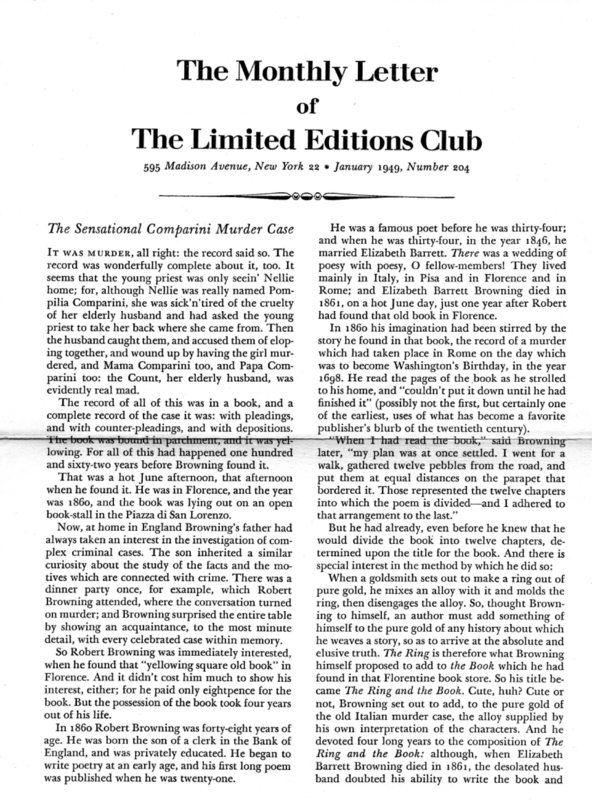 The LEC edition is on top; Heritage bottom. 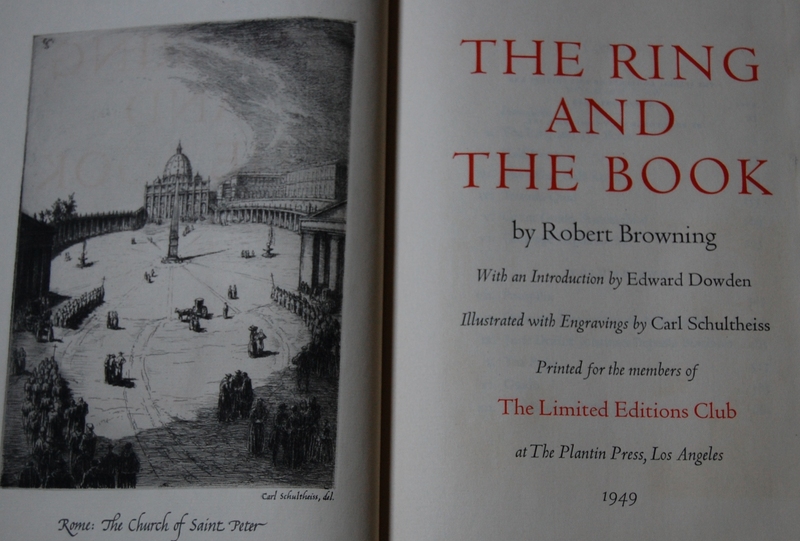 Front Binding – It’s time once more for a thorough LEC/Heritage comparison, and this go-around we have a book I covered long ago: The Ring and the Book by Robert Browning. 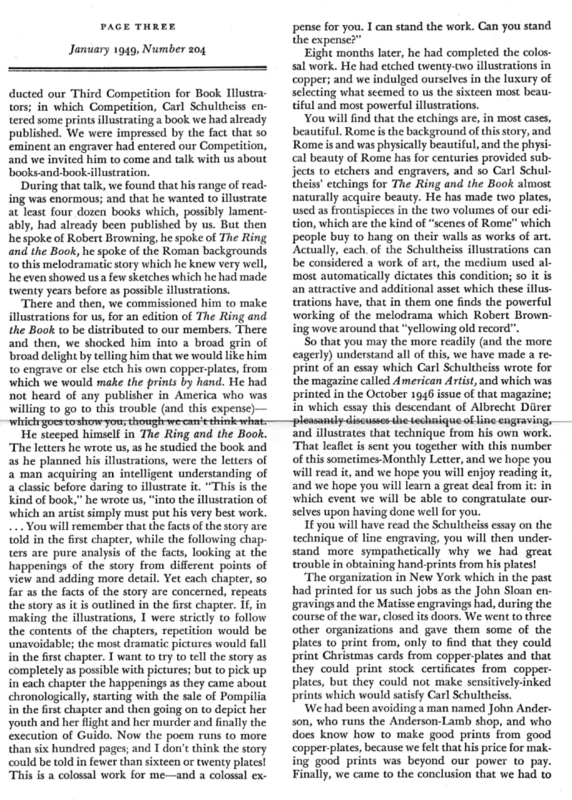 That post was sparse on details due to the lack of a Sandglass (and my lack of in-depth information on Browning, Carl Schultheiss, and the design), so I’m rewriting this whole thing to provide you, my fine readers, a much better glimpse into this lovely edition. The biggest difference between the LEC and the Heritage is the volume count: the LEC opted for two books, while the Heritage slams everything into an enormous tome. The next most obvious difference is the color scheme. 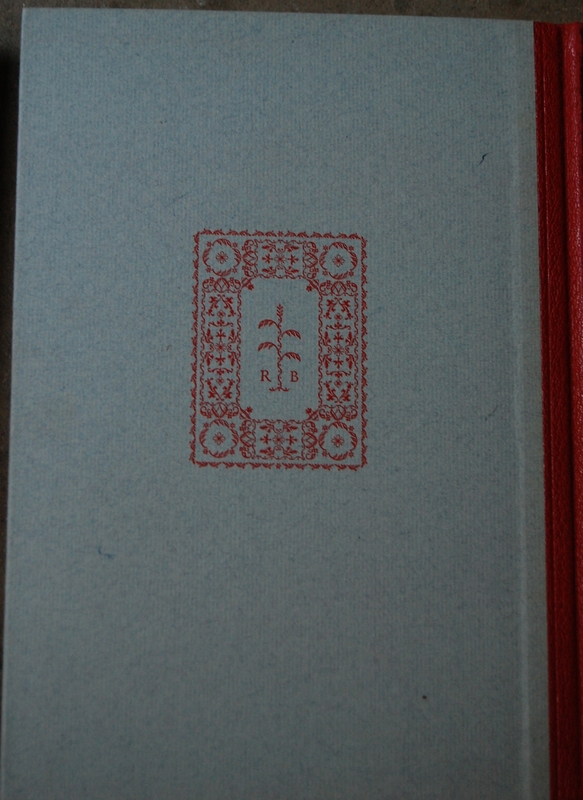 The LEC utilizes a lovely grayish-blue paper for its boards, offset by a luscious red leather for the spine. The Heritage…goes with salmon pink boards and a sea foam green spine. Not exactly the most pleasing of colors, I must admit. I do not know why these were chosen for the Heritage readership, but I prefer the LEC’s selection far more. Robert Browning was one half of one of the most famous poetic couples in literary history. His wife, Elizabeth Barrett Browning, was renowned as much if not more than her husband, and the LEC issued her Sonnets of the Portuguese one year before Mr. Browning received his first LEC, which is this particular volume. Valenti Angelo served as Mrs. Browning’s illustrator. 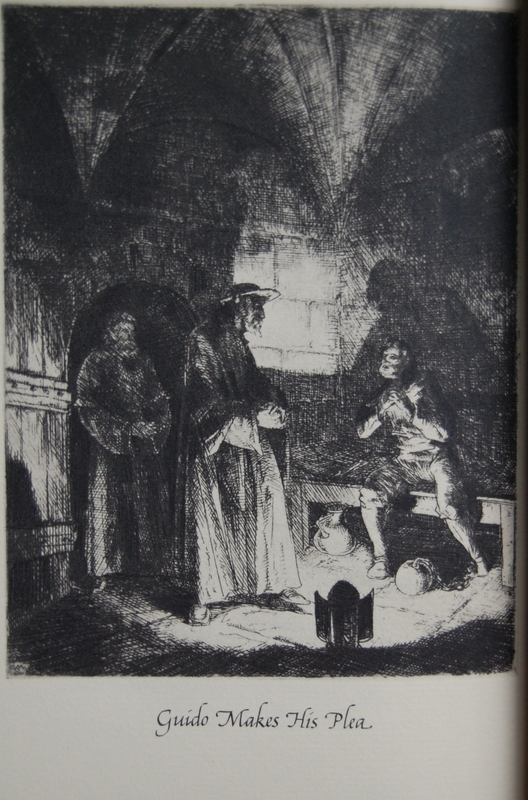 Robert would get a second LEC twenty years later when a compendium of his poems was issued in the George Macy Company’s twilight year of 1969, with Peter Reddick providing the artwork. Carl Schultheiss has a lovely bio of how he came to be involved with the George Macy Company in the Monthly Letter below, but I’ll briefly summarize it here. 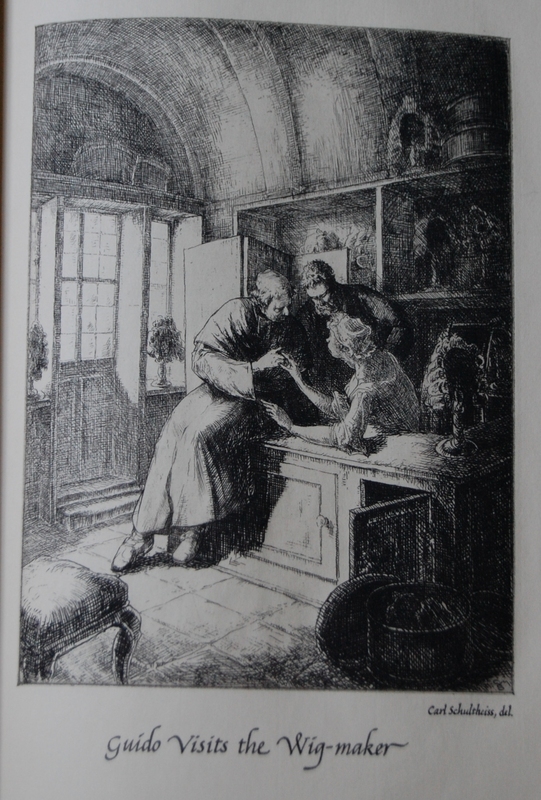 Schultheiss came to America in 1940 after establishing a name for himself in the engraving world in Germany, and entered the Club’s third competition for artwork accompanying their books. The Club was dumbfounded that Schultheiss, then world-renowned, would participate, and they immediately set out to see if the engraver would perform a commission for their readers. Schultheiss had many books he wanted to do, but nearly all of them were titles put out by the Club in past years. 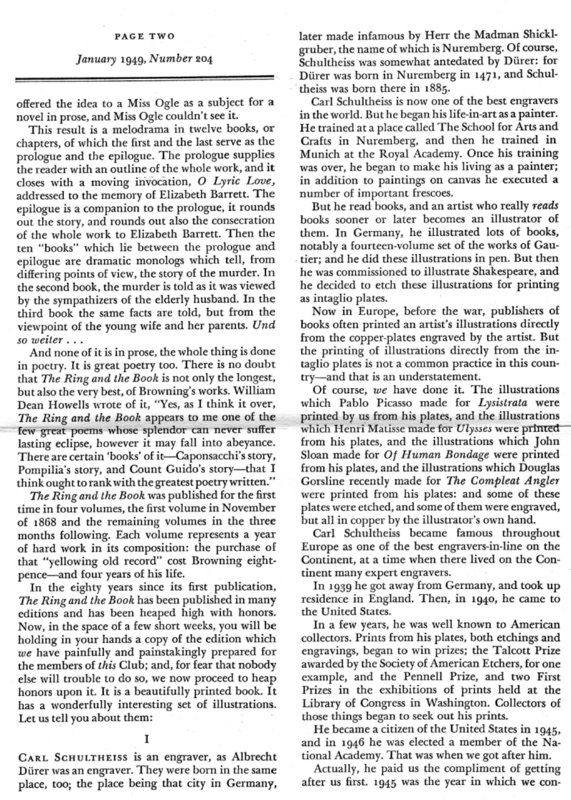 One, however, was not: The Ring and the Book. 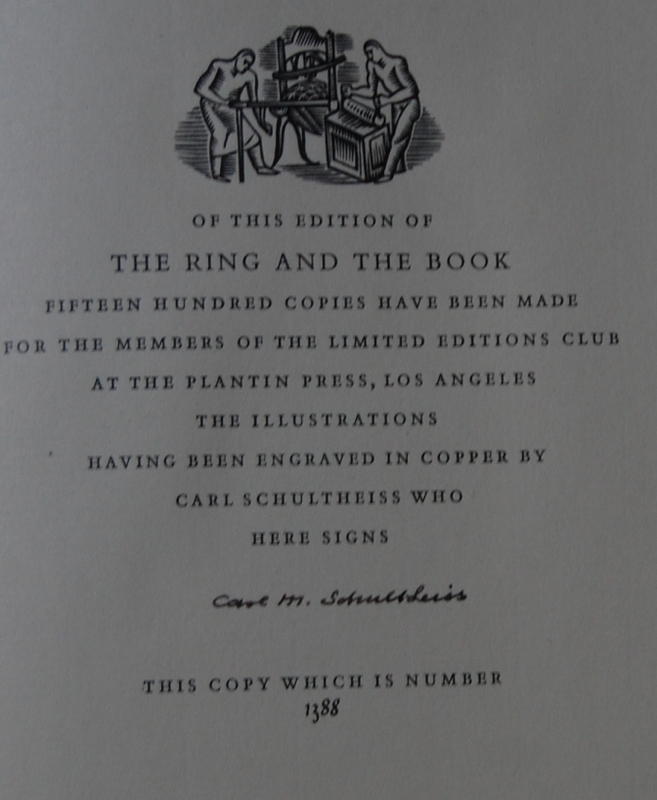 The Club hired Schultheiss to compose copper-plate engravings, and planned to print them by hand for their readership. 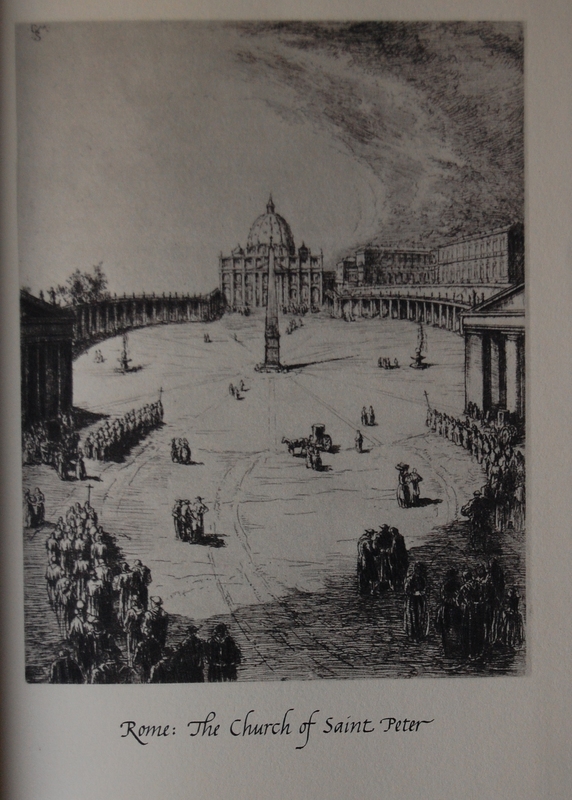 16 engravings out of 22 were selected, and thus we have this lovely book. Alas, Schultheiss never did a second work for the company. Design Notes – Saul and Lillian Marks were responsible for the printing and design of this book, and as seems to be the case for them, they knocked it out of the park. The Letter feels pretty strongly about this, as well, as they heap tons of praise on the family-run press. 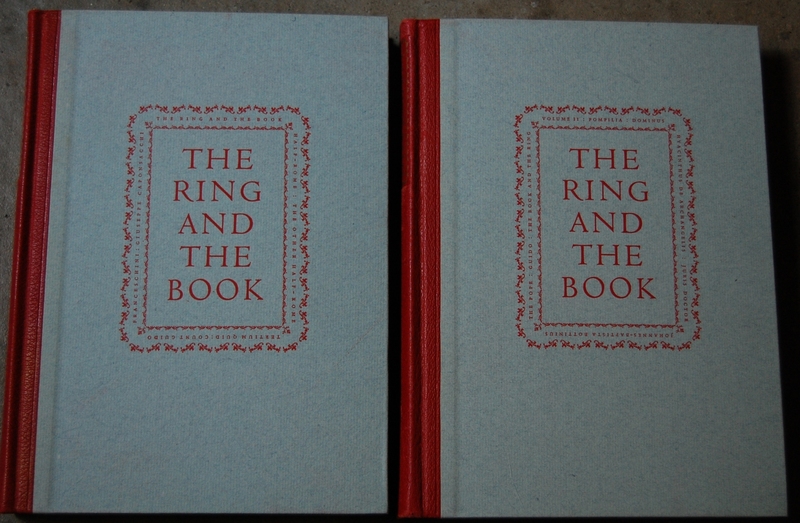 Saul designed the binding, while Lillian tackled the page design. 16 point Garamond was chosen to be the font, which was deliberately kerned together to promote a easy flow to the eyes. 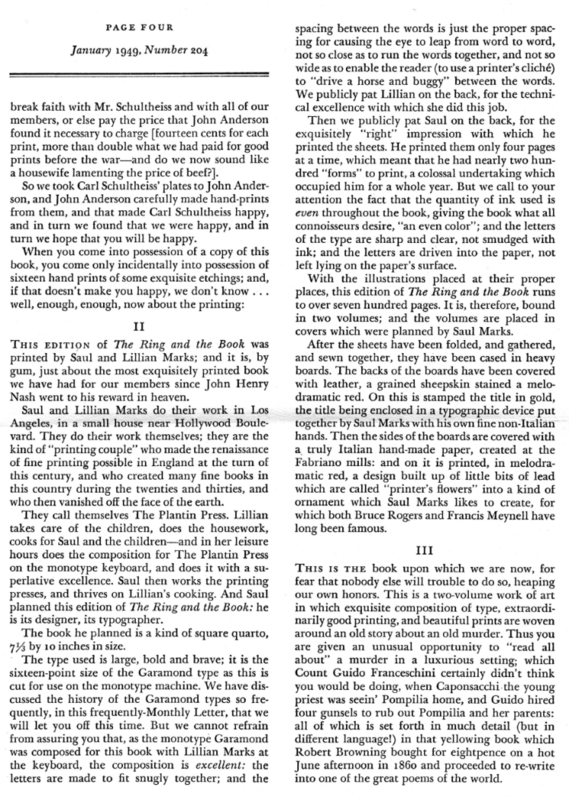 Pages were printed four at a time; a monumental undertaking given the number of pages in the book and that 1500 copies (plus the few lettered editions out there) had to be made! The reasoning was that the small print runs would provide the perfect amount of ink to each letter, preventing any bleeding, smudging or other printing anomaly. John Anderson was responsible for hand-printing Schultheiss’ engravings, and he delivered. The bindery is not explicitly mentioned, but the Marks were likely the ones to handle it. 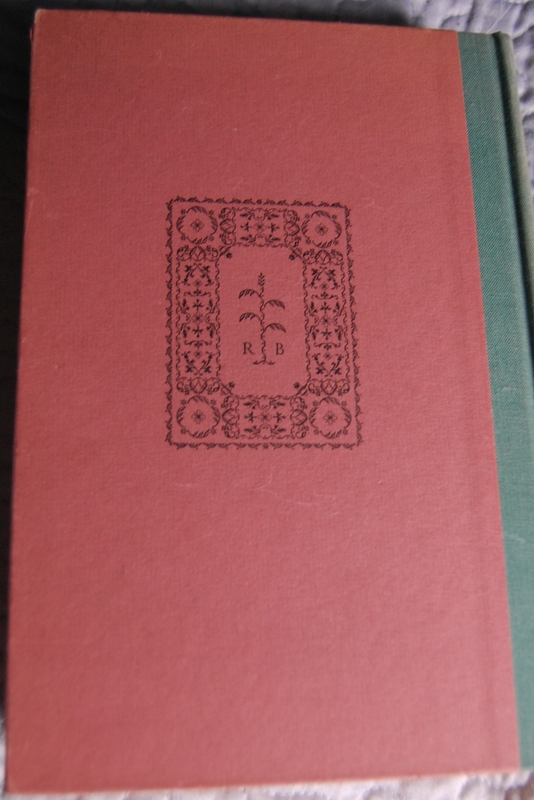 Back Binding – This ornamental piece gives the back a little more artistic flair than most of the other Macy books I own. Saul designed these. Title Page – Edward Dowden provides the introduction. You’ll notice that the title engravings are different between the editions, and that the LEC specifies the Plantin Press’ involvement. Colophon – Schultheiss signs this edtion, and this is #1388 of 1500 copies. 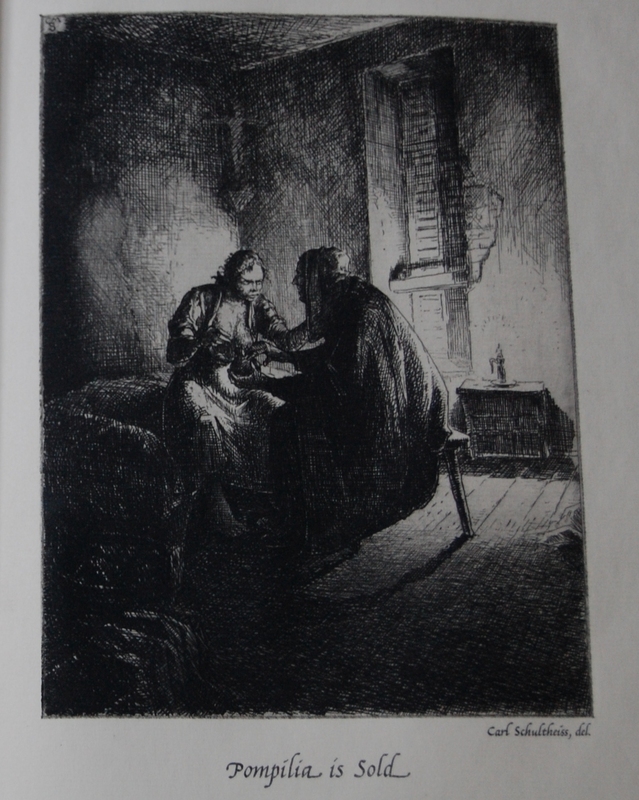 Page 20 – These are powerful, gripping illustrations. Awesome stuff. Shame Schultheiss didn’t do a second one. Page 4 – You’ll notice that Schultheiss’ signature is missing from these at the bottom. Personal Notes – I have some backstory on this title, as I’ve owned it three different times in three different editions. XD I was first given this book by my good friend Lois in exchange for a HP Poems of Robert Browning I bought at the anthropology club book sale (see Yates). I used to volunteer for Lois when she ran her own used book shop, and we have a very solid friendship. We still visit each other as often as time allows. 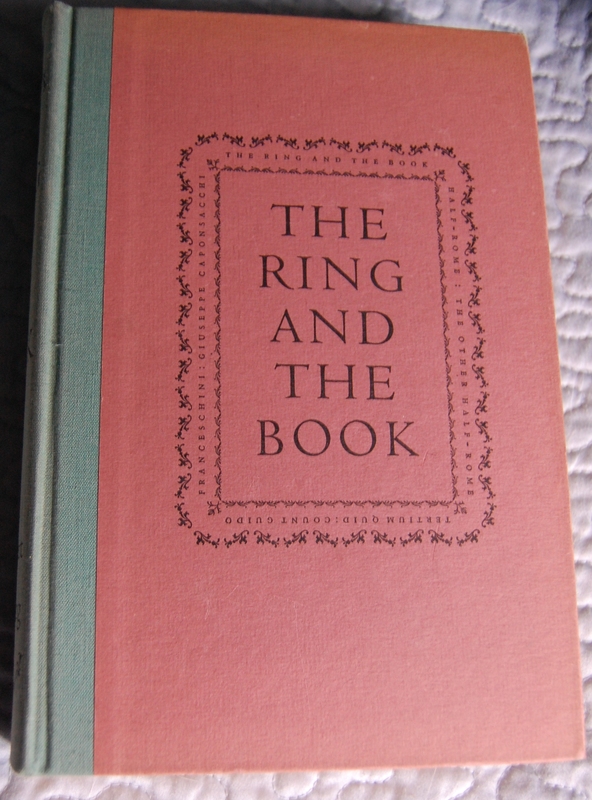 Unfortunately, this first book (which formed the basis of the original post) lacked a Sandglass and slipcase, and I sold it off due to its incompleteness and somewhat beaten status. I got a second HP quite recently, in January 2014 (or so) from the Oakhurst Library collectible sale. I wanted to properly read it, and for $3 or 4, it was worth a second dip. BUT! When I went to Monterey this past May, I went to the impeccable Carpe Diem Fine Books, and they had the LEC at a reasonable price of $125. My wife Tamara was planning on buying me a LEC for my graduation present, and this was the one she picked. So yay for me! I don’t have a Sandglass to share with you for comparative purposes, unfortunately. 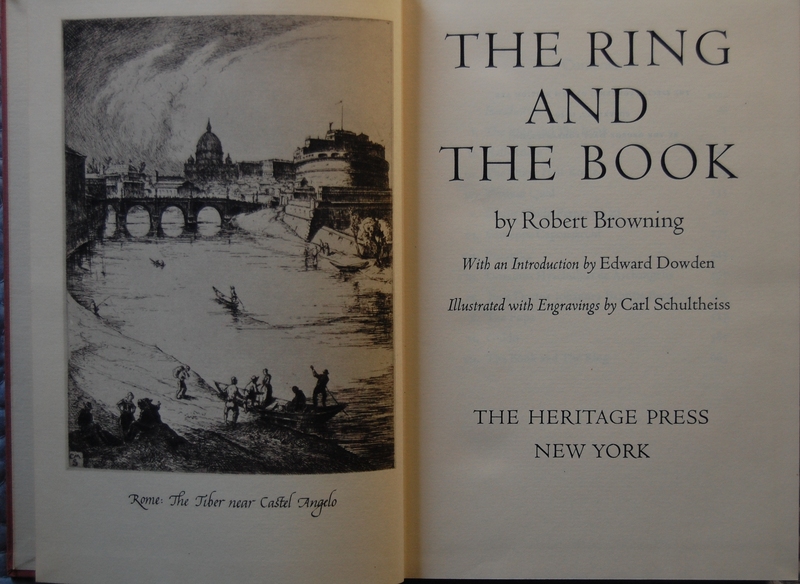 You are currently reading Limited Editions Club – The Ring and the Book by Robert Browning (1949) at The George Macy Imagery.